After unboxing the phone, Zack (not Jerry) wastes no time in beginning the torture. The first test involves scratching the phone's Gorilla Glass 5-topped display, and like most other phones', the display scratches with a Moh's level 6 pick. The home button, which is also glass-covered, takes no damage from a razor blade. The front-facing camera sits under the glass, so it's equally as scratch-resistant as the rest of the glass front, and the nylon-covered earpiece will be fine so long as you're not too rough with it. Going over to the back, Zack mentions that the Nokia 8 uses 6000-series aluminum instead of the stronger, more commonly used 7000-series. The iPhone 6 Plus used the same type of aluminum, and we all saw how that turned out. Keys leave no permanent marks on the back, but a razor blade does. 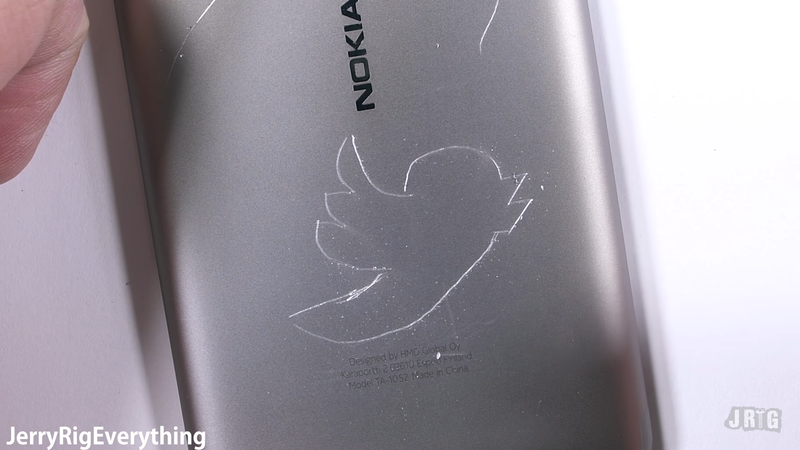 This is evidenced by the Twitter logo that Zack draws on the back, which he notes is named "Larry." The dual cameras are topped by glass, not plastic like on the Nokia 3, so they're well-protected. And while the sides, back, and buttons of the phone are metal, the top, bottom, and corners are actually plastic for better durability. Its about how you use it. 7000 alu or stainless steel would increase weight unnecessarily. We have full aluminium body, not just a ring. You can watch the full video via the embed above or the source link below.